Finally, some weather worthy of May! The sun’s heating up the country at last! It’s not every day that you get weather so lovely in this country, however, so it’s definitely worth making the most of it wherever possible. To that end, we here at Great Grass have a stunning range of artificial grass turfs that are the perfect way to make your garden a beautiful, evergreen outdoor area where you can enjoy every second that the sun is shining. It’s true; our artificial grass is simply unbeatable when it comes to those increasingly rare days when the sun is high in the sky and there’s not a cloud in sight, and you’ll barely have to raise a finger to keep it that way. Just an occasional once over with a brush to remove excess fluff and other build ups is all you’ll ever need to do to keep your artificial grass looking and feeling like brand new, with arduous chores like mowing, weeding, watering and more safely done away with thanks to a whole host of incredibly low maintenance qualities. Needless to say, our team will always be at the ready to guarantee nothing but the highest standards of service every time you need them, so there’s no reason not to place an order for your very own artificial grass today. 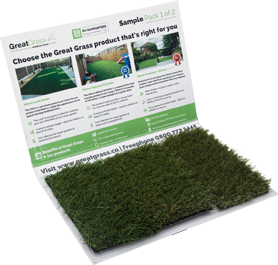 You can always get in touch to request your very own free sample pack if you’d like to see and feel just how incredible our grass really is. If you just can’t wait to get your hands on the perfect artificial grass for the summer sun that’s just starting to make an appearance, make sure you don’t wait to invest in what we here at Great Grass have got waiting for you in our wide and varied stock. Getting in contact is easy as dropping us an email or picking up the phone for a quick chat about what you need, so don’t wait to do just that!